At Ridgepointe Dental, Austin Amos, DDS, JD and his dedicated dentistry team offer patients in The Colony a wide range of dentistry services that exceed the highest patient expectations. You don’t have to take our word for it either. 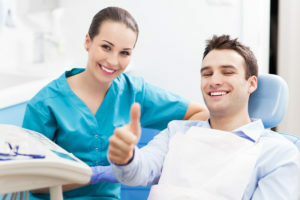 Our patients enjoy visiting us in our state-of-the-art, comfortable dental office so much that they often take the time to give us five star reviews, that we’re very proud of. We welcome patients of all ages to visit our office, and our team members work hard to create a positive dental care experience in a stress free dentistry office environment. Keep reading to find out more about what our patients have to say about the Ridgepoint Dental treatment experience, and don’t hesitate to call to schedule an appointment in our The Colony dental office. In addition to those reviews, thank you notes, and testimonial videos you can find on our website, we also receive great reviews from other platforms. Thank you, Joanna. We’re glad you felt important because you are! Thank you, Ann. You’re wonderful too, and we can’t wait to see you again soon! Dr. Amos is a dedicated to providing only the highest quality dentistry services through exceptional service and care. Any dentist can say that, but Dr. Amos really means it. He has dedicated the time to complete regular continuing education courses to stay at the leading edge of the dental field. With years of experience and advanced training, Dr. Amos can perform almost any dental service in our comfortable dental practice in The Colony. From basic dental care to complex restorative and cosmetic solutions, Dr. Amos is here to help you achieve your healthiest, happiest, most beautiful smile – and keep it for life!